The Documentation Center of Austrian Resistance (Dokumentationsarchiv des österreichischen Widerstandes, DÖW) was founded in 1963 by former members of the Austrian Resistance, victims of NS-persecution, and committed scholars from the sciences and humanities. The centre’s initiator and its scientific director until 1983 was Herbert Steiner, who had returned from exile in Great Britain. From the very beginning the centre had a nonpartisan and pluralist orientation: the Communist, Socialist, and Catholic-Conservative associations for the victims of Fascism, the Catholic Church, the Jewish community, representatives of the Roma and Sinti, and politicians sat on its executive board. 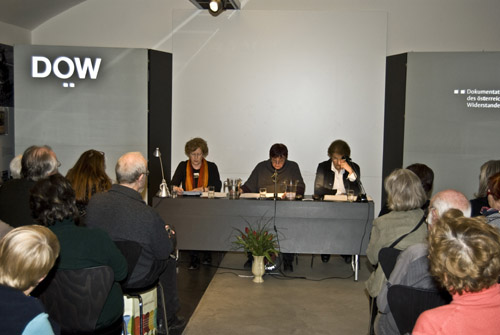 When the DÖW was founded in 1963 historical files were generally locked in federal and state archives, and the documentation of resistance and persecution via private files and copies from foreign sources was the main focus for historical research. From the mid-1970s to the mid-1990s there was an increase in collecting activity, the best evidence of which were publication series about resistance and persecution in the Austrian federal states (Bundesländer) and about Austrian refugees and expellees (“Österreicher im Exil”) with volumes about Great Britain, the USA and Latin America. In the 1990s the DÖW started to compile a database of murdered Austrian Jews. The resistance movements of all political and religious organizations within Austria. National Socialist, racial and political persecution of Austrians 1938-1945. The prosecution of Nazi war crimes and crimes against humanity (including Euthanasia crimes), and the compensation of victims after 1945. In the early years, primarily the fate of members of the political resistance was studied. However, in 1966, just three years after its foundation, the DÖW published a first version of Jonny Moser’s statistics about the victims of Nazi persecution of Austrian Jews (“Die Judenverfolgung in Österreich 1938-1945”). And DÖW was the first institution to publish a booklet about the almost complete extermination of Austrian Roma: “Österreichs Zigeuner im NS-Staat” (Austria’s Gypsies in the Nazi State, published also in 1966). Later to these two were added other victim groups, the largest being victims of the Nazi euthanasia program. Developments in Austrian politics in the 1980s – such as the Waldheim affair and the rise of the populist Austrian Freedom Party (FPÖ) ­– requested studies into two new topics, which became major fields of research of the DÖW: Austria’s coping with the Nazi past and rightwing extremism. “Transitional justice”/the efforts and failures of Austrian judiciary with regard to the punishment of Nazi crimes (performed the Research Agency for Postwar Justice, led by Winfried Garscha and Claudia Kuretsidis-Haider). In completion to the data base of Holocaust victims and other Nazi victims additional data bases provide information about Austrian volunteers in the Spanish Civil War, of Gestapo reports, and of biographical data of survivors. Some of these data basis are accessible only in DÖW’s finding aids inside the institution, others also in the internet. Further information on DÖW activities, announcements of conferences and lectures, a review of historical and political journals, book reviews etc. are included in the Newsletter of DÖW (“Mitteilungen”), which appears five times a year and can be sent free of charge to all interested parties; the “Mitteilungen” are also available as PDF (cf. Link collection of this site). The annual “Jahrbuch” of the DÖW is being published in April and includes a detailed activity report. This report is available also on the DÖW web site.